Every time cities propose a million- or even billion-dollar infrastructure upgrade, there’s one small seed of doubt at the back of people’s minds: Will it really be worth the cost? Houghton, Michigan, no longer has to ask that question, thanks to some new pipes that proved themselves during a recent heavy storm event. 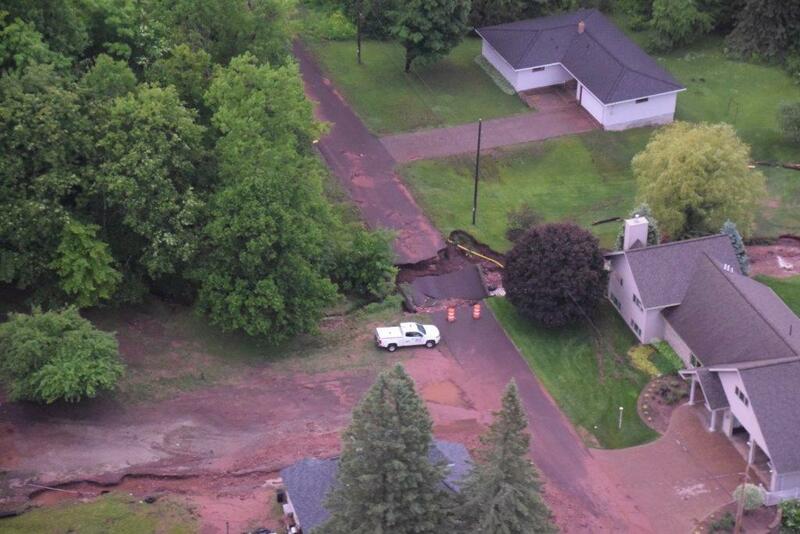 The early summer storms moving across Michigan’s Upper Peninsula dumped as much as 7 inches of rain in a few hours time, washing out a number of roads in the Houghton area and beyond. “Our stormwater system took a pretty good pounding, as it wasn’t designed for that amount of rain fall in that amount of time. We had several structures that needed repair or replacement,” says Ryan Avendt, utilities superintendent. “Interestingly enough, we didn’t experience any major damage to the infrastructure in the city. Replacing aging galvanized and clay tile pipe, especially in areas that experienced washout, became Houghton’s saving grace — even in areas where pipe was completely exposed, the newer pipe materials held up to the strain. “Had it not been for major system improvements over the last decade, the areas of town that experienced major washouts and road damage would have left exposed 100-year-old water main, old compromised galvanized service lines and old clay tile sanitary sewer mains and services,” Avendt says. Despite receiving all that rain in such a short time, the city didn’t experience any main breaks. The flash flood was designated an official state disaster, damaging several buildings along with the road washouts. Despite this, both water and wastewater systems withstood the brunt force of the event. In the immediate aftermath, the city performed a crude initial assessment. Since there wasn't much visible damage, they waited to see if leaks developed, monitoring the water plant’s daily pumpage. Two sections of 12-inch PVC wastewater pipes were damaged, but crews set up a bypass on one section, and the other was temporarily rebuilt. I-beams and straps supported the fix, as its original foundation had washed out. Both water and wastewater systems were fully restored by the end of July, most of that time spent rebuilding sections of road before crews could repair the damaged sections. Though the stormwater system was overburdened, they didn’t experience any overflows, and the treatment plant kept up with the increased demand. Drawing their source water from wells became a huge asset, as some of the local surface water quality was impacted. Despite a countywide precautionary boil water advisory, the distribution system was not compromised. What's In Your Drain Cleaning Arsenal?